...and puppy dog tails. That's what little boys are made of; and I can't wait to get my newest quilt packaged up and shipped off to my newborn nephew! As you can tell, the Memphis area finally got some real snow. It's just a few inches, but that's enough to play in. We have already had several days off of school for winter weather this year, but all we've gotten is ice, so this is a wonderful change. These past couple of snow days have afforded me just the break I needed to get this quilt done. Vast expanses of snow would make some really beautiful pictures, but when you have a ten year old boy, no snow is left pristine. This snow has been used for everything from sledding to snowball fights, and my wild thing has been having a blast in it. When I was cutting the fabric for this quilt, I was in such a hurry that I completely forgot that my fabric was doubled, and ended up cutting double the number of bricks I needed...oops! Well, waste not, want not! The extra bricks made the back of the quilt a little busier that I would rather, but I still like it. 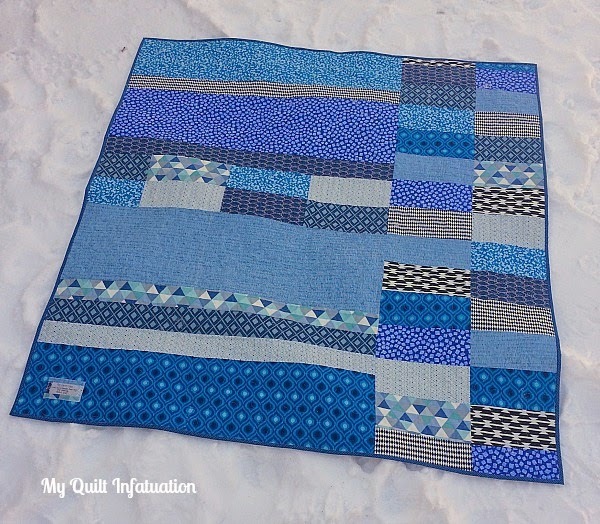 I had this cute royal blue pin dot print in my stash, and I think it frames all of the blues in this quilt perfectly. My sister in law's favorite color is royal blue, so that just makes it even better! The finished quilt measures 56 x 56 inches, so it's a size and style that he will really be able to use for many years. Every new baby (and parents) need burp cloths, so I also sewed up a few of these to include in the package. I always keep some of the cloth diapers on hand, and I pick up flannel remnants all the time so I can make a set at a moment's notice. They make such a cute and quick gift. I tied this little bundle of three up with some of the binding fabric. I figure that most of you already know how to make these, but if there is any interest, I could write a tutorial. What do you think? oh, and ps- now that we've gotten some snow...bring on spring! Very cute finish. I actually like the back of the quilt best! I'd be curious to see your variation of the burp cloths. It's hard to tell in the bundle but do you put the flannel across the entire length of the diaper or just down the center section? The quilt is so lovely & I´m sure your nephew will love it! So cute! 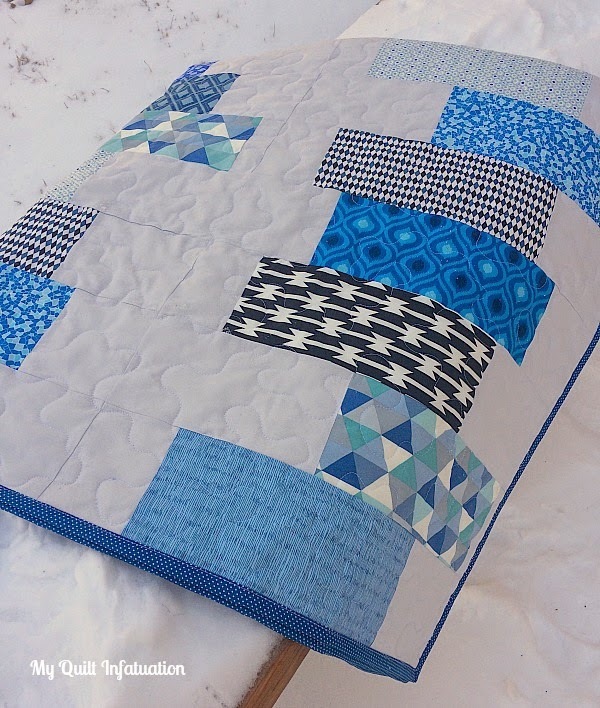 Love the block placement, and the blues go together so well! That's a great idea to pick up flannel remnants for burp cloths! What an adorable gift....love the idea of using a cloth diaper for one side of the burp rag!! 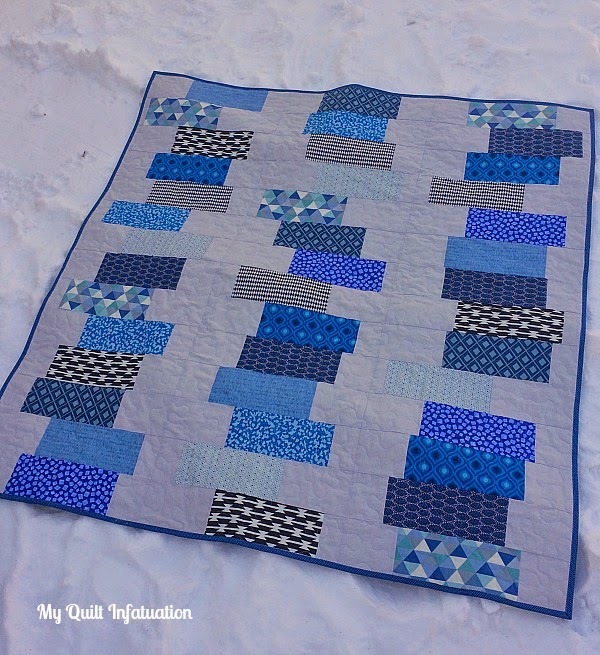 I love the blues and gray quilt, especially the backing! Very cute. The burp cloths are a nice touch. Hi Kelly, I love your Snips and Snails quilt - one very lucky nephew! another wonderful quilt ! I have always admired how rounded and even your quilt stippling is. I would really appreciate some tips on how you do that. very cute quilt! Love the back too - its two sided! 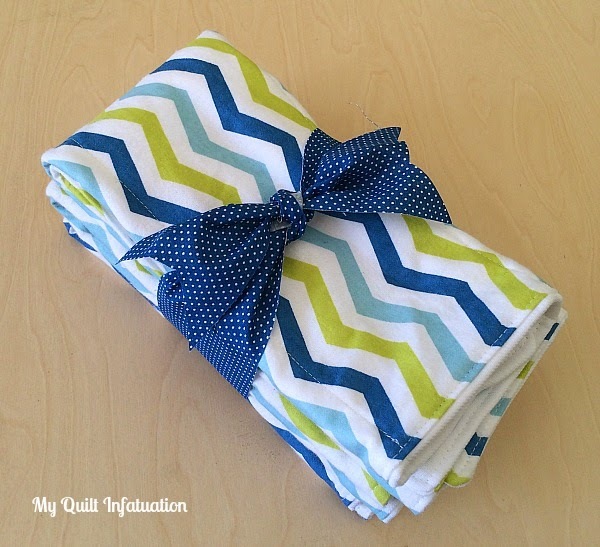 A burp cloth tutorial is always a good thing! 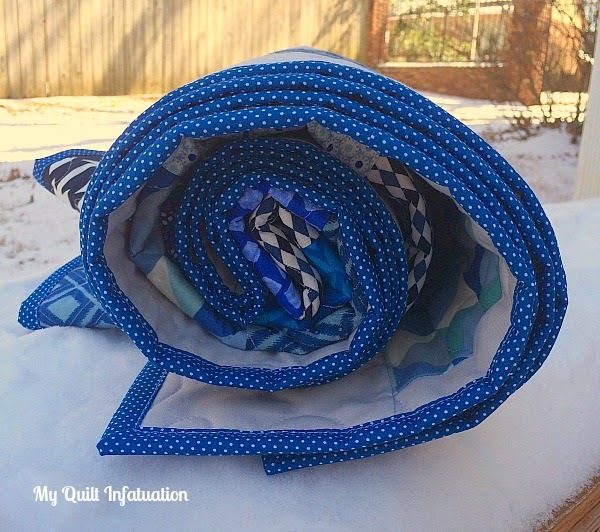 Thanks for the quilty inspiration! I'd love to see your method for the burp cloths! I think it's hilarious hat you cut double in the blocks! A much better predicament than the other way around. The back looks great! You have such a knack for pieced backings. They are like modern compositions all on their own hiding away on the backside. I hope you get to hold that newest nephew soon!